Welcome to Andrei Ol'khovatov Web-site in English! 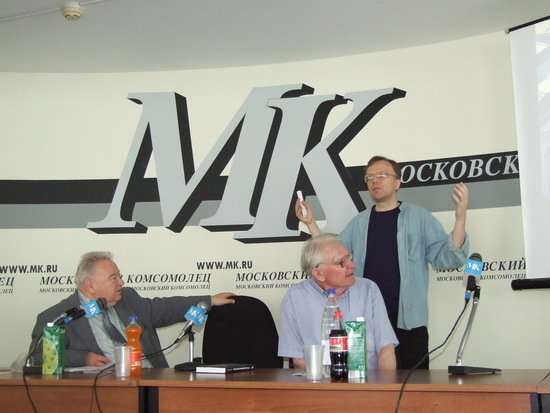 From left to the right: a famous Russian cosmonaut Doktor (a scientific degree upper to Dr. in Russia) Georgy Grechko, a veteran of Tunguska research Dr. Viktor Zhuravlev, and me - Dr. Andrei Ol'khovatov at the Tunguska 2008-new approaches conference on June 27, 2008 (photo by Dmitry Alekseev, http://web.mk.ru/meteor/conf.asp ). "One thing I learnt in a long life, that all our science, measured against reality, is primitive and childlike - yet it is the most precious thing we have"
Here you can read about: the 1908 Tunguska event; electrophonic sounds, geophysical meteors, and many other exciting things. The site is under permanent updating. A few words about me, i.e. the author, Andrei Yu. Ol'khovatov. By the way, please pay attention that sometimes my surname is translated in English as Olkhovatov, i.e. without apostrophe (compare with: Ol'khovatov). It is because the apostrophe means "myagkii znak" in Russian (a Russian letter meaning a sign of softening of spelling), and the letter is absent in English. I was born in 1960 in Moscow, Russia. In 1983 I graduated from the Physical Department of the Moscow State University. In 1992 I have defended my thesis/dissertation, and became Cand. Sc. (Phys.&Math. ), which corresponds to Ph.D. in USA approximately. From 1983 to 1986 I was working in the Radio Instrument Industry Research Institute. From 1987 to 1992 I was working in TsNPO "Vympel", and then have returned to the institute, where I worked as a senior scientific worker. In 2001 I got off the job at the institute and moved to a part-time job in a civil non-state firm, which has a little (if anything) to do with science. So now in science I am independent researcher/expert, and I feel much more free in expressing my scientific opinion. Despite that noboby pays for my scientific investigations, I consider science as my work, and not just my hobby. My hobbies are: listen to good music, especially such as swing and classic rock'n'roll, and sometimes maybe even dance to it (but it is very rare in these years). Also I like to walk. My another hobby is to read books on, to say:'a human and human society in extreme situations', which means people behaviour and feelings at war, etc. How does it affect behaviour and relations of a person with others and society? Probably it is sooner psychology. I live in Moscow, Russia with my mother. A BRIEF VERSION OF 'THE TECTONIC INTERPRETATION OF THE 1908 TUNGUSKA EVENT'- My idea on the origin of the 1908 Tunguska event (I can say, that it becomes rather popular in Russia). A LARGE VERSION OF 'THE TECTONIC' INTERPRETATION OF THE 1908 TUNGUSKA EVENT - Large version of the article which goes to another free web-host www.tunguska.eu5.org/tunguska.htm (with less web-host advertising). If for some reason the latter is not accessible, then you can read an older version at www.olkhov.narod.ru/tunguska.htm still. TUNGUSKA RESEARCH AND OTHER NEWS- Here you can read news on the 1908 Tunguska event's research (which are not presented in the above-mentioned Tunguska article) and on other topics. TUNGUSKA 2008 INTERNATIONAL CONFERENCE - Info on the the TUNGUSKA 2008 International conference. TUNGUSKA 2003 INTERNATIONAL CONFERENCE - Info on the the TUNGUSKA 2003 International conference. TUNGUSKA 2001 INTERNATIONAL CONFERENCE - Info on the TUNGUSKA 2001 International conference. THE 1998 KRASNOYARSK INTERNATIONAL CONFERENCE ON TUNGUSKA- You can read about the conference and its abstracts. TUNGUSKA AND OTHER PICTURES- Here you can see pictures related with the 1908 Tunguska event and on other topics. CATALOG OF TUNGUSKA WITNESS'S ACCOUNTS - There are (in Russian) several hundreds Tunguska witness's accounts in a form of a Word-file. GEOPHYSICAL METEORS - This www-page is devoted to the phenomenon, which resembles meteors, but has non-meteoroidal origin (some of them are real mini-Tunguskas!). The item below, "ROCKET LIGHTNING, MAYBE" is on other possible examples of geophysical meteors, associated with aviation. METEOROIDAL METEORS - This www-page describes 'usual' i.e. astronomical meteors, produced by spacebodies (meteoroids). Despite that in general the meteor phenomena are rather well-understood, there are still many unknown and/or anomalous aspects. In there you can read my AIAA Paper 2000 - 0589 on anomalously high meteors. Another mysterious meteor phenomena - electrophonic sounds are in the separate section below, due to their importance. ELECTROPHONIC SOUNDS - Electrophonic sounds are sounds simultaneous with a flight of a bright bolide. Modern science just recently was to recognize them, as their nature is still a mystery. In there you can read about them, including my letters published in METEORITE!, and NEW SCIENTIST magazines. Please pay attention that this link goes to my web-page on another free-web-host. TEKTITES - Discussion of these and similar anomalous rocks. VIDEO OF METEORS- A special web-page on some meteors which I was able to video. The videos are as html5-video, so some browsers may have problems with the videos unfortunately. Associated text is in Russian and in English. This my www-page was previously placed at my www-site www.geocities.com/olkhov.